Infrastructure financing and development in the Pacific is almost entirely funded through foreign aid, and subject to persistent criticism. A recent example came from Australia’s Minster for International Development, Concetta Fierravanti-Wells reviving a well-trodden critique of China’s aid program. In Vanuatu, the major donors are Australia, New Zealand and China. Each donor country chooses to finance infrastructure in, and through, a partially negotiated pact with the Vanuatu government. Such decisions, however, are heavily weighted towards the interests of the funding nation, and largely determined by the political interest of each country’s respective foreign aid funding priorities. 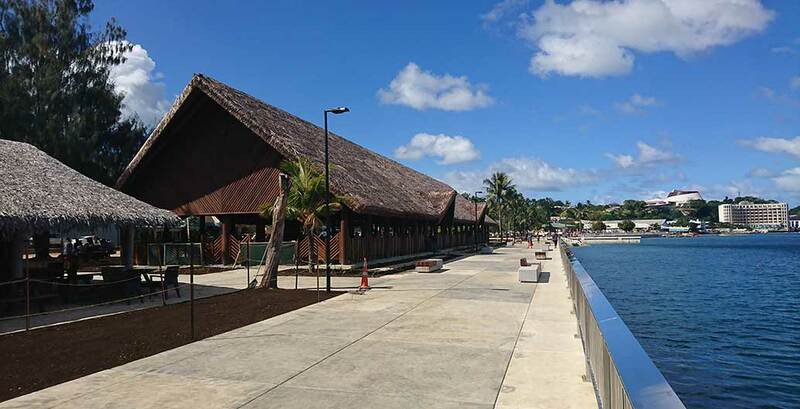 Unlike the Chinese-funded Vanuatu convention centre project, which was widely criticised as a vanity project, the New Zealand government was very careful to avoid similar critiques. 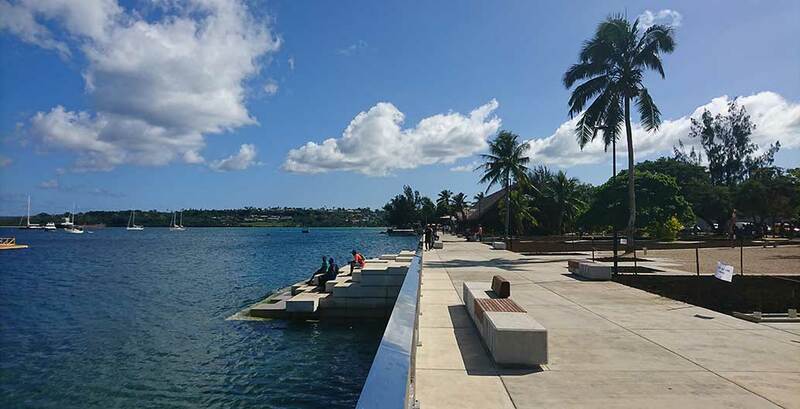 In the case of the seafront precinct in Port Vila, Vanuatu’s capital and largest city, New Zealand’s Ministry of Foreign Affairs and Trade determined that funding the redevelopment of the harbour seawall and adjacent parkland was a good investment. 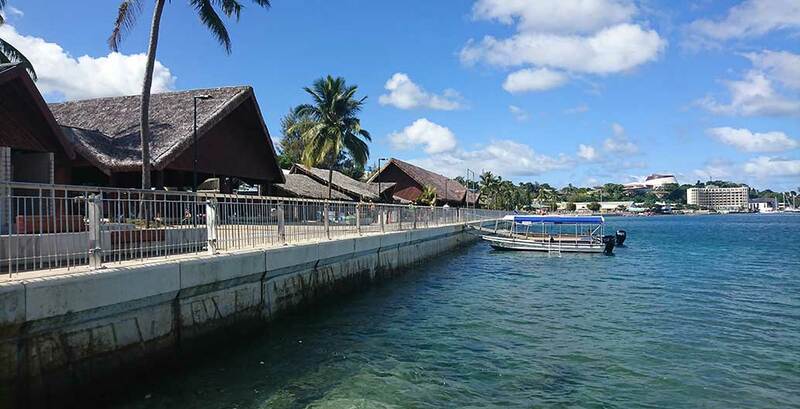 Unlike the Chinese-funded Vanuatu convention centre project, which was widely criticised as a vanity project, the New Zealand government was very careful to avoid similar critiques. The value proposition for the seafront development was to provide dual benefits: enhancing the tourist visitor experience while providing urban spaces for local people. With that in mind, the international design, planning and engineering practice, BECA, was engaged to deliver the project. The first aim of the value proposition sought to encourage tourists to spend more time and money at the seafront. Tourism is the largest sector of the economy, accounting for around 20 percent of gross domestic product. 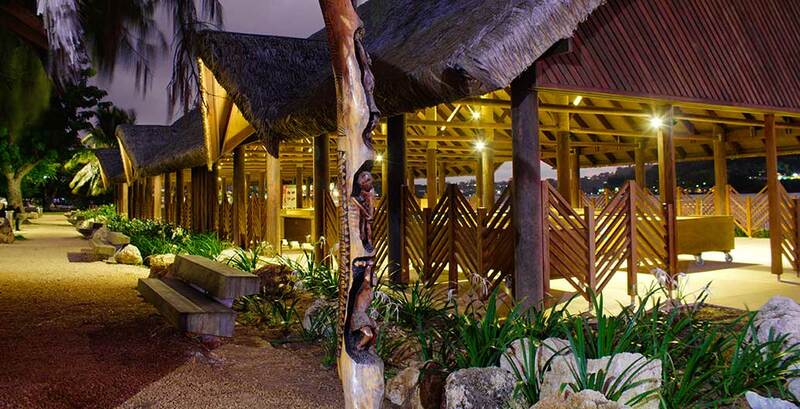 The centrepiece of the tourism experience is two market houses, exclusively selling made-in-Vanuatu products and services. The funding included a requirement that vendors within the market would be banned from selling imported products (almost exclusively from China). The revenue raised through the leases with vendors would then go to developing supply chains, and improving the quality and consistency of local products. These include woven pandanus baskets, hats and ornaments, sculptures, jewellery, art work and other products, made in the eighty three inhabited islands of the Vanuatu archipelago. The second aim, to provide urban spaces for local people, is straight from the place-making play-book. Unlike place-making in many other parts of the world however, the project success came less from community-led processes, than from responding to the way a low income, vulnerable community engages in public space. Although place-making is a persuasively positive force in landscape architecture, it has been significantly compromised on signature waterfront projects in both Australia and New Zealand, where communities are often dispersed, lack the vocabulary to discuss place-making goals, and succumb to political and private interests. 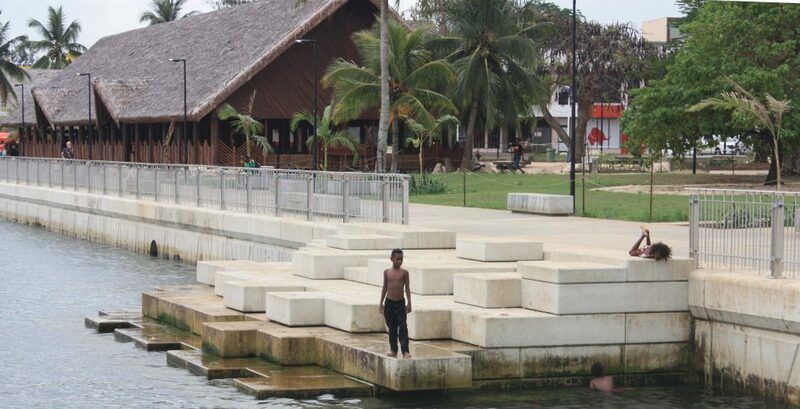 In a developing island nation such as Vanuatu, the social and economic constraints result in a very different form of design process, laying bare the realities of delivering a large public realm project in the Pacific. 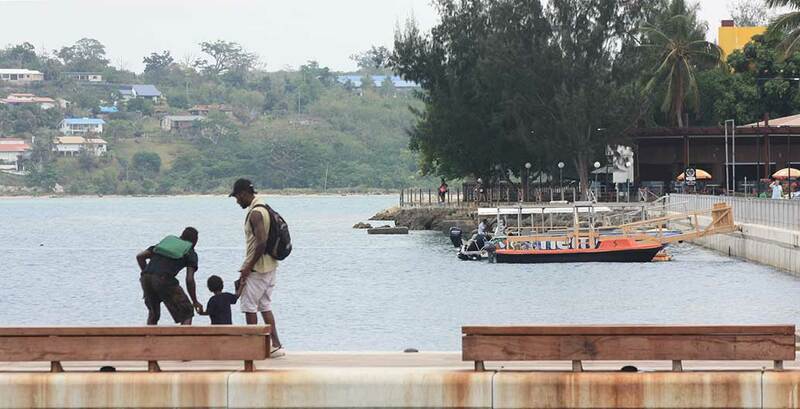 The Port Vila seafront is place-making ‘island style’, because of two challenges not experienced in developed countries. In commencing their work, BECA’s first and foremost consideration was to address vulnerability. The United Nations Institute for Environment and Human Security determined Vanuatu as the most vulnerable nation to natural disaster in the world. For BECA, design resilience was a precondition to all other considerations, rather than a competing aspiration. In March 2015, the category 5 cyclone Pam directly hit Port Vila, displacing thousands of people and destroying many buildings in the city, including the old seawall, established trees and surrounding market houses. Following the physical destruction, another and perhaps more damaging consequence, from an economic perspective, was the almost complete collapse of the in-bound tourism industry for three months afterwards. 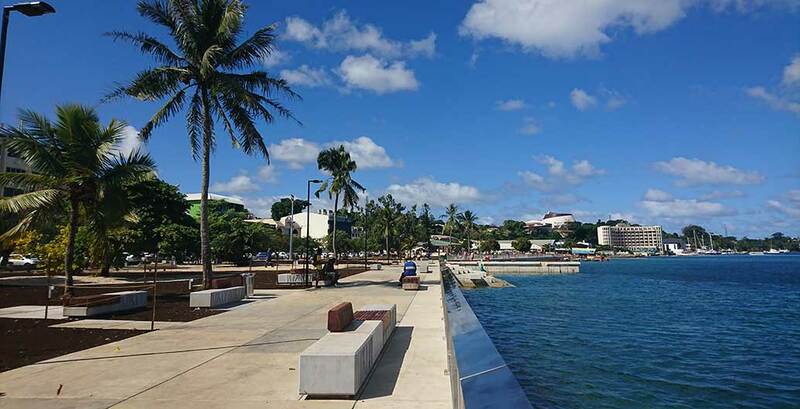 The seafront project, still in its early design phase in 2015, was prioritised by the New Zealand government, and with additional funding from the Enhanced Integrated Framework and the Vanuatu Government, the project was completed two and a half years after the cyclone. Today, tourists can browse the markets, while local Ni Vanuatu relax in the parks or swim in the harbour. The seafront design brief, negotiated between governing bodies rather than community bodies, explicitly ruled out privatisation of public space. The second design consideration related to the lack of institutions that protect public access and use of open space in Vanuatu. Port Vila lacks a town plan, and development regulations are weak and poorly applied. Waterfront land in many developing countries risk public exclusion by resorts or private homes. The seafront design brief, negotiated between governing bodies rather than community bodies, explicitly ruled out privatisation of public space, in large part because New Zealand as the aid partner was shielded from local private sector influence. In keeping with their own foreign aid aims, to develop prosperity and stability in the Pacific, the project design brief effectively acted as surrogate protectors of public access to the waterfront. Using their influence, the project proponents have effectively designed-out commercial precincts that exert soft regulation, to favour private interests. This is seen in café strips along southbanks, docklands and harboursides in Auckland, Melbourne and Sydney. Along the 1200 metre long redevelopment, less than 20 metres of frontage is dedicated to commercial cafés and tour operators. Vanuatu is not a consumer culture. Over half the working age population are unemployed (or choose not to work) and the average annual income is just under $3,000 AUD. Therefore the experience of public space is oriented towards informal gatherings on lawns, swimming in the harbour or just sitting under the trees that survived Pam. 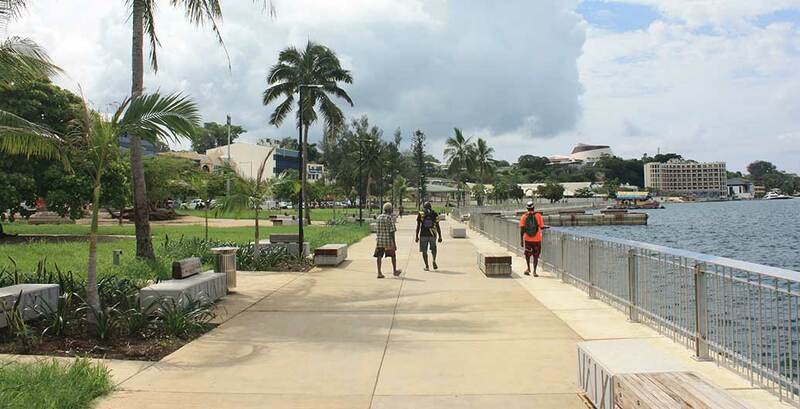 Port Vila’s waterfront was planned for democracy, where access and opportunity are the preconditions for citizens of a vulnerable nation, to develop and express their own public sphere. Place-making typically seeks active and democratic participation in the design process, with results that will satisfy everyone’s interest. This is difficult to achieve in developed countries, due to powerful political and private influences. Landscape architecture in the Pacific operates under a different set of political and financial pressures. 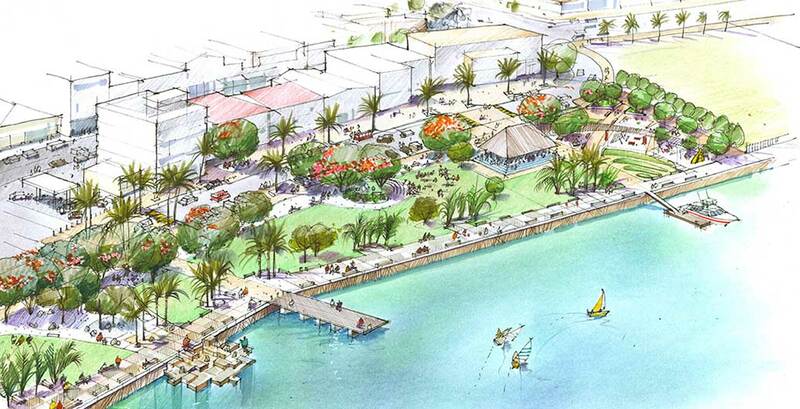 Rather than planning democratically, as is expected in a place-making project, Port Vila’s waterfront was planned for democracy, where access and opportunity are the preconditions for citizens of a vulnerable nation, to develop and express their own public sphere. Conventional participatory processes that landscape architects aspire to, were difficult to implement, due the institutional challenges and politics of aid funding. However, democratic space in Vanuatu is expressed through the citizens’ willingness to gather rather than consume as an act of public expression. 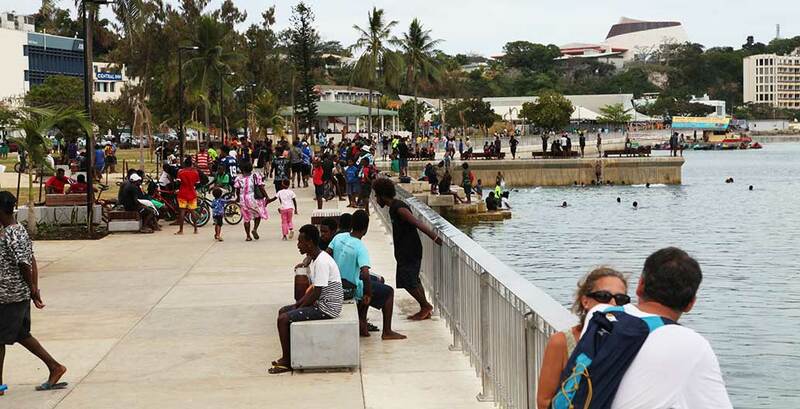 The Port Vila seafront, while safeguarding spatial and social equity of access in a way that many projects in Australia and New Zealand do not, still faces considerable challenges. While the structures are engineered to resist the forces of cyclones and earthquakes, the capacity of local institutions to effectively manage the assets or recover after a catastrophic event remains a concern. Building the public sphere won’t necessarily increase tourist spending in the market houses, however a stronger public presence in a country with few other assets than the people themselves, may build resilience by strengthening the very idea of public space. Dr Andrew R MacKenzie is a Registered Landscape Architect and academic. His research interests include open space management, governance and planning issues related to urban landscapes. Andrew is currently working and researching in Vanuatu.